issue of Police Chief Magazine. On August 5, 2012, a white supremacist opened fire in the Sikh Temple of Wisconsin in Oak Creek, a suburb of Milwaukee. The attack resulted in the death of six Sikh worshipers and the injury of four others—including Oak Creek Police Lieutenant Brian Murphy who was first on the scene. After swiftly responding to the call at the Temple, the Oak Creek Police Department (OCPD), together with the town’s civic leadership, turned its attention to reassuring the victims—and all 35,000 town residents—that they were safe and to guiding the community forward in the aftermath of the devastating violence. 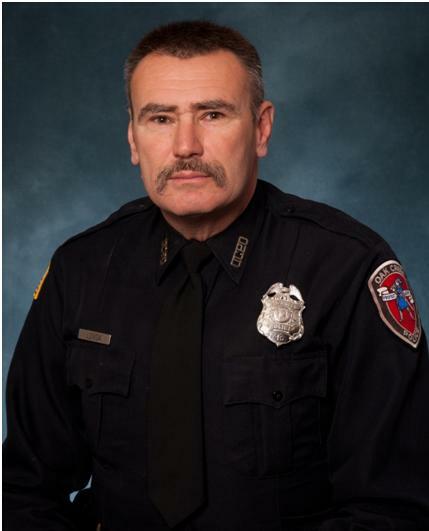 When he was promoted to lead the OCPD in 2011, Chief John Edwards continued the agency’s emphasis on proactive training for officers and strong relations with the community. In the months that followed the attack, OCPD expanded these strong commitments by providing clear information about the attack and the subsequent investigation, consistently fielding questions and concerns from the public, and working directly with residents to establish new preventive public safety measures. Sunday, August 5, 2012, members of the Sikh Temple of Wisconsin had gathered to prepare for Sunday services. Disobeying their mother’s orders, two children ran outside to play in the front yard and were the first to see a man drive up and start shooting. As the children raced back into the temple to warn everyone, the shooter left two people dead in the parking lot and proceeded to enter the temple. As people rushed to find hiding places and call family, friends, and 9-1-1, the shooter walked through the hallway, knocking on doors, and shooting whomever he came across. The first officer to arrive on the scene was Lieutenant Brian Murphy, a former U.S. Marine, 22-year OCPD veteran and the department’s emergency management expert. Seeing him arrive, the shooter, later identified as Wade Michael Page, ran out of the temple and headed toward his car. Lieutenant Murphy called to him, and the two came at each other, firing simultaneously. Wade’s first bullet hit and went through Murphy’s throat, hitting his vocal cords, ricocheting off his vertebrae, and landing in his torso. As Murphy dove for cover behind a car, Page continued to shoot as he approached the car. Lieutenant Murphy maintained eye contact and stayed strong even after a bullet knocked his gun out of his hand. He ultimately sustained 17 bullet wounds, including a shot in the back of the head, where the bullet is still lodged. When Lieutenant Murphy heard the voice of Officer Sam Lenda in the distance, he claims he knew Page’s rampage was finished. OCPD’s lead trainer and a 30-year veteran of the department, Officer Lenda took action quickly—stopping his car and retrieving his squad rifle. When he saw the threat, he shot at Page and moved up as the shooter went down. When Page went on the move again, Lenda moved further into the parking lot in his vehicle, determined to run him down or find him and shoot him; he was not going to let the shooter enter the temple again or leave the parking lot. A subsequent gunshot heard by additional responding officers turned out to be Page killing himself with a bullet to the head. Breaking down the shooting incident and reviewing the responses of OCPD officers on the scene, Chief Edwards was satisfied that they all made very good decisions and minimized further violence and deaths. The department, community, and the United States consider the responding officers heroes for their response, dedication, and courage. According to Chief John Edwards, the six minutes of great police work that took place on August 5 started 15 or 20 years ago with OCPD’s commitment to conducting extensive internal trainings. He explains, “The day of the shooting at the Sikh Temple, the one thing that those officers really didn’t need were supervisors or anyone telling them what to do. 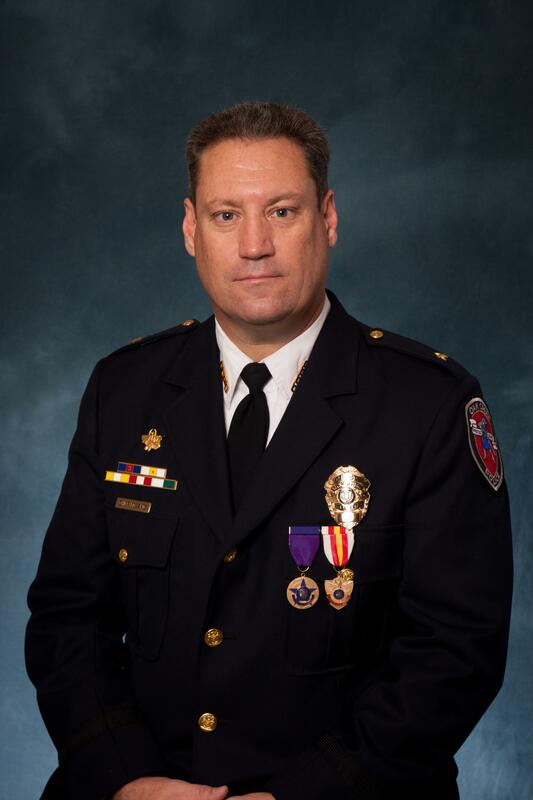 What they needed was training, knowledge, and equipment.”2 Edwards credits previous Chief Thomas Bauer for putting the department in the position to properly handle such an incident. Law enforcement is traditionally set up to be reactive, responding to the “hue and cry,” but OCPD has fostered an environment of training and consistent, meaningful outreach to the community for a more preventive approach. The department also respects that the men and women who are in patrol cars on any given day hold the liability of the entire city in their hands with the decisions they might make in seconds. Chief Edwards wants to ensure officers understand that responsibility. OCPD strongly reinforces this responsibility through a broad training curriculum, which includes regular updates on hate crimes case law, circulated by an officer on staff who previously served as an assistant district attorney in an adjoining county. Additionally, as part of their in-service training, officers learn to investigate thoroughly and document everything, so prosecutors have all the information to ultimately decide whether a hate crime enhancer should be attached to a charge. Street officers will not necessarily be able to make that determination while working a case, but they are trained to thoroughly document details about the victim and to investigate the suspect, including past actions, statements, or affiliations that might indicate he or she was motivated by bias. Outreach to Oak Creek’s different religious groups is an important component of the department’s community engagement activities. If a group is worried about being the target of a hate crime, or has any other security concerns, OCPD works closely with them to conduct security surveys, develop security plans, and run background checks for employees, among other activities. Every faith group in the city can request these services. For example, the leader of the local Egyptian Coptic Church is on the “hit list” of the terrorist organization al Qaeda, so the department has coordinated an in-depth program with the church, which supervisors reinforce during roll call. OCPD is in touch with members of that church on a daily basis and have a presence during any scheduled events. When the Sikh community first came to Oak Creek six years ago, the department offered similar protective services, but the temple leadership declined at the time. Based on their experiences in India, the elders mistrusted the police and could not fathom cultivating a working relationship with OCPD. Other important components of the department’s community outreach efforts include the annual National Night Out and a community resource civilian staff person on duty. An important characteristic of OCPD’s training and community engagement activities is a guiding philosophy of respect—for officers in the department and for community members. As chief, Edwards has worked on expanding the department’s Career Survival training, which focuses on helping officers navigate the complexities of a career in law enforcement. The ongoing trainings address ethics, how to treat people with respect, and avoiding unnecessary confrontations that can derail an officer’s success. The training also serves to address the needs of officers who have been involved in shootings and other violent incidents. Recognizing that the police department is effectively a community of officers and their families, OCPD seeks to support and serve its members, so they are prepared to serve the greater community with respect. while a camera crew from Not In Our Town covers the meeting. In the immediate aftermath of the shooting at the Sikh temple, OCPD was grateful for support from intelligence units and tactical teams from Milwaukee County Sheriff’s Department, Milwaukee Police Department, and the FBI. Additionally, the Department of Justice provided victim witness services, and Chief Edwards received offers of assistance from police departments across the United States. When it came time to address the community though, Chief Edwards reached out to Oak Creek Mayor Steve Scaffidi and the two leaders worked closely to establish a goal: going forward, they would stand together to provide strong, visible, unified leadership for their devastated community. After a brief preliminary press conference the day of the shooting, Chief Edwards and Mayor Scaffidi carefully prepared for a more detailed press conference the following day. The mayor spoke first, sending the message that the city was actively responding to the crisis and was committed to addressing ongoing issues. Next, Chief Edwards assured residents that they were safe and shared as much information as he could without jeopardizing the investigation. He offered detailed information about the actions the department had taken, including the clearing of the temple and a grid search of over two miles, in which officers knocked on more than 300 doors to ensure there were no additional shooters. Two days after the shooting, Oak Creek’s National Night Out event, organized by OCPD’s community outreach professional Kim Bogadi and city leaders, was scheduled to take place. Though unsure if the community would turn out for this usually popular event, OCPD added a candlelight vigil to the night’s program, to provide an opportunity for residents to express solidarity with the Sikh community and support for the families of the six people who were killed and the four who were wounded, including Lieutenant Brian Murphy. When he arrived that night, Chief Edwards was amazed to find the biggest crowd that had ever attended the annual event—5,000 people gathered in the center of town for the vigil. Residents expressed shock that such an attack could happen in their own “backyard,” and spoke of their commitment to supporting the Sikh community and to continuing to celebrate the diversity of their city. Chief John Edwards told the crowd that in his 28 years of law enforcement, he had seen a lot of hate and a lot of anger, but he had never before seen the kind of compassion, concern, and support that had emerged in the wake of the tragedy. He announced that the police department planned to work very closely with the Sikh community to make sure they felt safe. Mayor Steve Scaffidi recalled later that as he looked across the sea of people—many wearing white headscarves in honor of the Sikh tradition—he made a commitment to stand with the Sikhs for as long as he is mayor. In the days and weeks that followed the shooting, media outlets from around the world called upon the OCPD to provide comments. Chief Edwards and other department representatives shared as much information as they could about the attack and subsequent actions without jeopardizing the investigation. Although the event was expected to be national news, the department was unaware of the political aspects of the story. The OCPD learned that the Sikh community, together with interfaith groups and civil rights organizations, had been advocating for the FBI to amend its Uniform Crime Reporting form, which tracks hate crime statistics annually. As he discovered when he filled out his own report about the shooting at the Sikh Temple of Wisconsin, there was no way to denote that the hate crime victims were Sikh; Chief Edwards had to check “Other” on the form to describe them. As a result, it was impossible to retrieve official statistics about hate crime attacks directed at the Sikh community. This became a dominant theme in news articles and at the U.S. Senate Judiciary Committee’s hearing, “Hate Crimes and the Threat of Domestic Extremism,” held on September 19, 2012. Security stands guard at the door of the Sikh Temple of Wisconsin. The investigation of the shooting quickly revealed that the shooter was a white supremacist. Although that activity is rare in the area, OCPD identified local groups Page was part of, and began accessing intelligence shared by the greater law enforcement community. While this work was a priority within the department, in addressing the community, Chief Edwards emphasized two messages: Oak Creek will not tolerate hateful activity, and the department was doing everything it could to keep all residents of Oak Creek safe. The day after the shooting, Chief Edwards, Mayor Scaffidi, and other city representatives met privately with members of the Sikh community. Without the media present, members of the temple asked candid, tough questions about the attack, the police response, and what the city would do to make sure it never happened again. Edwards and Scaffidi made a series of commitments to the Sikh community to work with them and to ensure their safety. One key outcome of that meeting was OCPD’s moving forward with executives from the temple to develop and implement a robust security plan. Another key outcome was a strong, direct working relationship between the department and the Sikh community. These days, OCPD third-shift officers stop by the Sikh Temple of Wisconsin at 5:00 a.m. for their break and have tea with members. Officers frequently write up their reports in the temple’s parking lot, and a squad car is always present in the lot for any major events at the temple. The department has also encouraged members of the temple to report any type of suspicious activity. OCPD has also expanded the cultural competency components of its monthly inservice training for officers. The department invited representatives from the Sikh temple, the Egyptian Coptic church, and other local churches to present a series of classes to teach officers about their communities and traditions. The department looks forward to sharing this information with Oak Creek residents at the next National Night Out, so everyone will be more familiar with the different cultures and religions that are part of the city. Many other community partners are involved in the city’s enhanced community engagement activities. Mayor Scaffidi appointed one of the elders of the Sikh temple to the city’s Community Development Commission, so their voices would be included in important city planning issues going forward. OCPD has also been working with the school district and the fire department on a plan to put medical trauma kits in every classroom. In case of an active shooter event or other emergency, teachers will be able to help treat wounded individuals immediately, rather than standing by while someone suffers. The partners are currently researching funding opportunities for the kits. Additionally, plans for the new city hall include an information booth highlighting photos and information about the history and diverse cultures of the city, together with practical information for residents about how to secure permits, and so forth. In the months that followed the shooting at the Sikh temple, Mayor Scaffidi attended many meetings with religious and interfaith groups where residents acknowledged the hard work city leaders had done and the strong partnerships they had forged in the wake of the tragedy—and encouraged them to capitalize on that good work and expand their efforts. This confidence was the impetus for the mayor’s new Oak Creek Cares initiative. A donation-based, non-profit organization, Oak Creek Cares was set up to fund crime prevention activities that are not covered by the existing city budget. Residents can propose additional lights for a public park, an information flyer about a public safety issue, and other things. The project will actively engage Oak Creek residents in a partnership with law enforcement and civic leadership to raise awareness of issues and prevent crime. It launched in the spring of 2013 with a $10,000 donation from a local company. 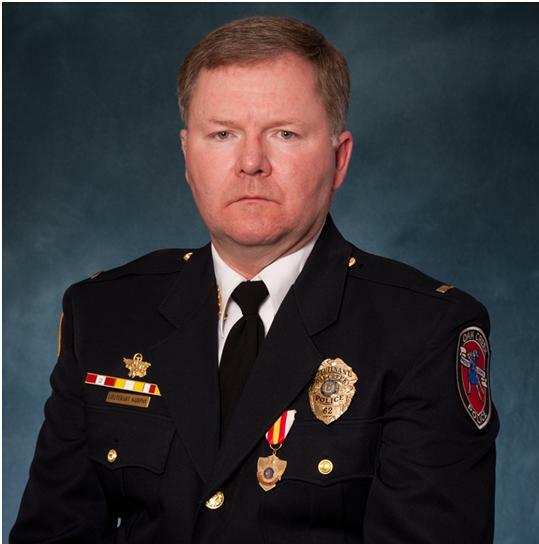 On May 17, 2012, the city of Oak Creek awarded Lieutenant Brian Murphy and Officer Sam Lenda the Oak Creek’s Citizen of the Year award for their heroism in response to the shooting at the Sikh Temple of Wisconsin. Days later at its annual awards ceremony, OCPD honored individuals and other police departments for their service. At both events, members of the Sikh temple attended, offering gratitude and appreciation to the officers and community leaders. Chief Edwards reflected that from the tragedy has emerged a new relationship and strong working partnership with the Sikh community. Prioritize education and training for officers. The men and women in uniform will be grateful that they have everything they need to effectively respond to incidents and to successfully work with members of the community. A smart, robust training program leaves a powerful legacy for officers many years down the line. Be proactive about reaching out to and establishing positive working relationships with different cultural groups in the community. By establishing strong working relationships with diverse groups, the department greatly increases its intelligence about what is happening in the community and expands the capability for preventive action. Groups that might be targeted for hate crime attacks should be engaged to discuss potential increased security measures and the importance of reporting any incidents or suspicious behavior immediately. Maintain a strong, visible leadership role in the aftermath of a hate crime or any public safety crisis. Support may come from regional or national agencies, but it is crucial that the community see local leaders standing together and taking action. Especially after a hate crime, victims and the targeted community need to feel supported, and all residents need to feel confident that the police department is taking a powerful stand against hate and protecting the safety of all residents. Be transparent and share as much information about an incident as the department can without jeopardizing an investigation. Members of the community want to know what is being done to ensure their safety, and it is important to be up front with them. In addition, the media wants to be the first to report any activity, and rumors or misinformation quickly spread if they do not check their sources. The rise of social media has exacerbated this unproductive cycle. Maintain a strong relationship with the media; “No comment” does not get you anywhere. When the media calls, from local to international press outlets, provide a comment and let them know how the department is handling a situation. Again, be as transparent as you can without compromising an investigation. This approach pays dividends, because media outlets will come to know that the department is honest and straightforward. In the future, if there is a need to get new information out, or to correct misinformation that has been circulating, you have established partners who can help. Be approachable—agree to meet with anyone in the community. Especially after an incident, families and/or the targeted community may have tough questions to ask about the event and the department’s actions. Always agree to meet with them and answer their questions. This does not mean you have to meet in front of the media or the greater public; make time for candid, private conversations. Establish a standard of meaningful community engagement that encourages residents to bring in new ideas. When residents see the department reaching out to groups in the community and proactively addressing problems, they will feel confident that they can approach the police as partners to address other public safety issues. This builds trust between police and the community, and encourages residents to take ownership of crime prevention activities. Thoroughly investigate and accurately report every incident that might be a hate crime. By taking a strong stand against hate, police instill confidence in the community that they are making sure all residents are recognized and protected. By submitting accurate monthly reports to the FBI, local police make sure that everyone is counted. 1 The Not In Our Town: Working Together for Safe, Inclusive Communities initiative is a result of Fiscal Year 2012 Community Policing Development program funds (2012-CK-WX-K021) from the U.S. Department of Justice Office of Community Oriented Policing Services. 2 Chief John Edwards, video interview conducted by Not In Our Town, February 13, 2012, as part of the organization’s production of a film about the incident. 3 Corrie Mitchell, “Religious Leaders Welcome FBI Hate Crimes Reporting,” On Faith, blog, The Washington Post, June 6, 2013, http://articles.washingtonpost.com/2013-06-06/national/39782813_1_hate-c... (accessed August 28, 2013). 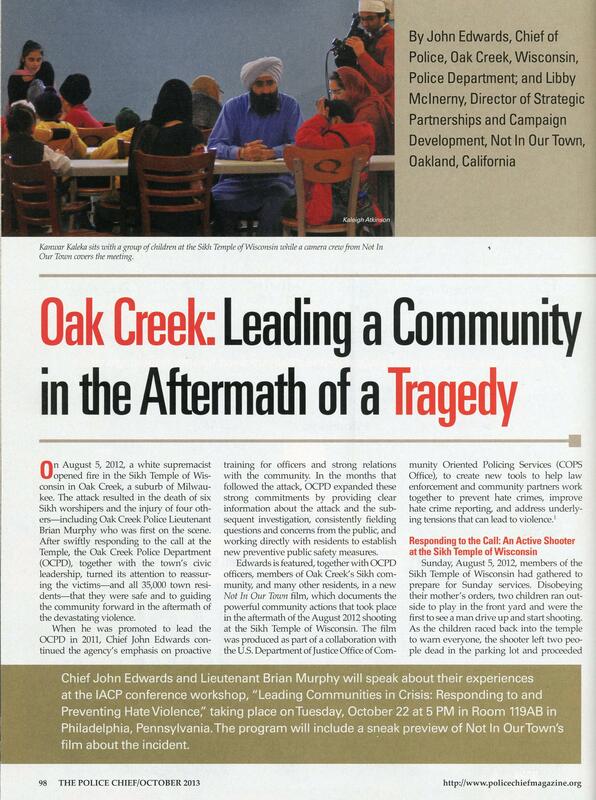 4 Eric Holder, Department of Justice, “Healing Communities and Remembering the Victims of Oak Creek,” The Justice Blog, August 2, 2013, http://blogs.justice.gov/main/archives/3233 (accessed August 28, 2013). Not In Our Town’s film about Oak Creek will be available free to the public in 2014 at www.niot.org/cops where all resources produced through the collaboration with the COPS Office are offered. As part of the initiative, Not In Our Town is recruiting law enforcement leaders to serve as mentors for the greater law enforcement community. For more information, please visit www.niot.org/cops/network. John Edwards and Libby McInerny, "Oak Creek: Leading a Community in the Aftermath of a Tragedy," The Police Chief 80 (October 2013): 98–106. From The Police Chief, vol. LXXX, no. 10, October 2013. Copyright held by the International Association of Chiefs of Police, 515 North Washington Street, Alexandria, VA 22314 USA.